Commonly called the Swamp Cypress or Bald Cypress, Taxodium distichum is a deciduous conifer. It has a good growth rate and will form a natural tall cone shaped tree. 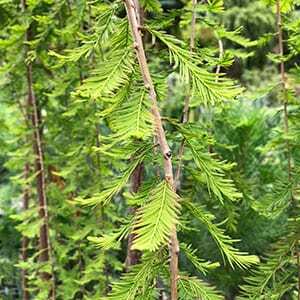 One cultivar Taxodium distichum ‘Cascade Falls’ if a grafted weeping form which makes an excellent feature plant in any damp position. As the common name suggests its natural habitat is in moist soils, however it is very adaptable. The foliage is pale green with a soft look, as autumn comes around it turns to a deep orange to brown. ‘Cascade Falls’ is different and more suited to smaller gardens. Being a grafted plant height will be restricted to to stem it was grafted onto. It will require some pruning and this can be done in winter for best results. This is also a variety that is suited to growing in courtyards in containers where it adds great form and colour from spring through to autumn.